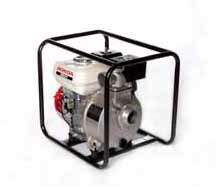 The Honda WB20 is a centrifugal pump for pumping clean and dirty water. It is powered by a 4-stroke OHV Honda petrol engine. It has a protective tubular steel, easy carry frame with anti-vibration mounts. It is fitted with an oil alert, to protect the engine from misuse. Recommended maximum suction lift is 6 metres. Supplied with hose couplings, washers, clips and strainers. Hose supplied separately.